Les Truies performing at the Festival of Rochefort in Belguim. The legendary Henry Salvador, the oldest comedian and singer on earth, has passed away. "90 years of music and gags", declared French president Sarkozy. 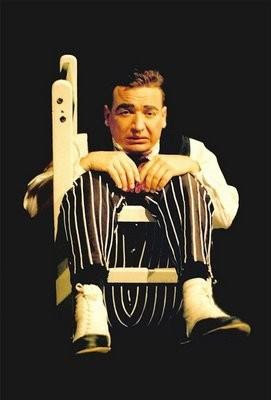 In this video, his version of the "whisky gag" at the Italian TV in 1962. 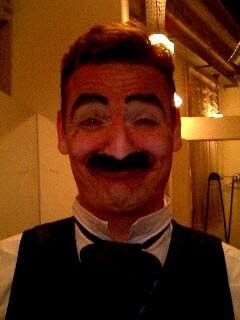 Somewhere between Red Skelton and Fumagalli. Here's a refreshing change, it's Harry Dann wearing Harry Dann's makeup. 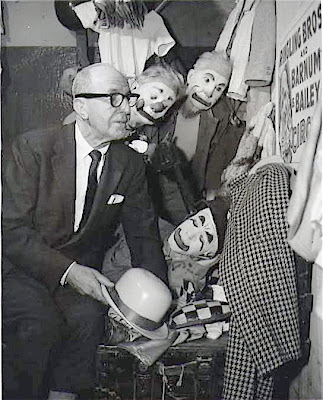 Harry was the quintessential mid-century "picture clown" with his image promoted heavily during his years with the Ringling Bros. and Barnum & Bailey Circus. 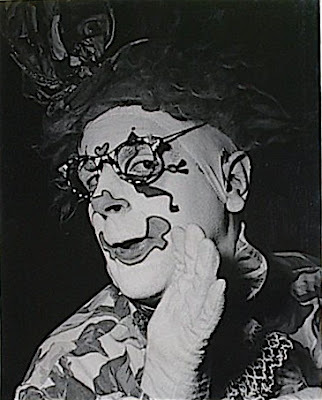 Harry's distinct neat whiteface makeup was appropriated by scores of other clowns and continues to be used to this day on posters, programs and circus tickets around the world. Don't make that face at me, Missy! To ask Ms. Allison when she will be sending me my homemade cookies, please click here. 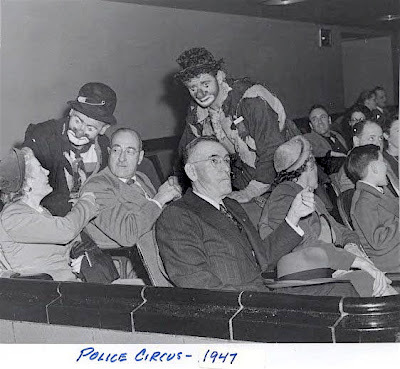 Looks less like a Police Circus and more like two clowns entertaining contestants at at a Woodrow and Mrs. Wilson look-a-like contest. The legendary Yuri Nikulin, considered by most to have been far superior in the ring to more colorful and "party friendly" Oleg Popov. Nikulin's partner in the video is likely Mihail Chuidin. A little explanation about Nikulin's routine blow off. In Russia it's traditional to eat a cucumber after drinking vodka, to avoid a hangover (looks like it works !!! ); so the crazy thing is that after spilling all the vodka, Nikulin and Chuidin (yes, it's him), lick their hands to have a little vodka and then they share a cucumber, as if they drank a lot. Nikulin's expressions are absolutely priceless... he was suffering way too much; maybe it was REAL vodka !!!. 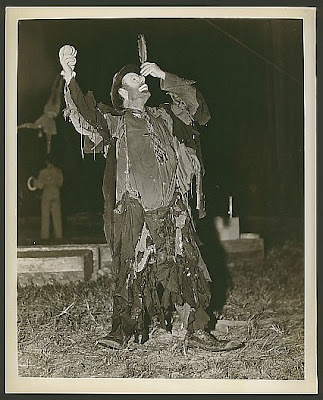 Perhaps Mike Karp can offer up some stories to go along with this Uncle Miltie snapshot. 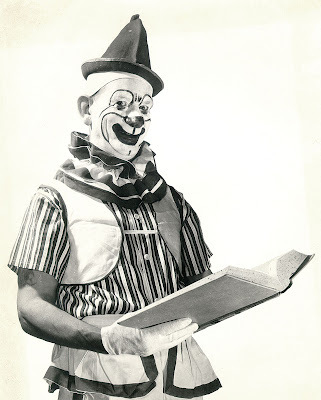 Along with Red Sketon, Lucy and now Milton having some direct ties to Clown College, it might be interesting to hear what the early clowns grads remember of these days. In the photo it looks like we have Michael Karp, Keith Crary, Chuck Sateja, Reggie Montgomery, Jim Howle and Prince Paul. 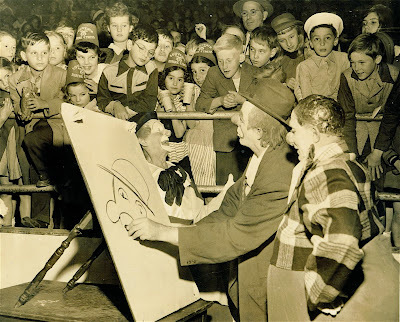 I'm not sure about the identities of the little person next to Milton or the whiteface in the straw hat. You send homemade cookies to Rich Potter?!? To find out more about "Betty Crocker" here, please click here. First, an emotional and sincere Thank You to those who have been remembering Richard Slayton. 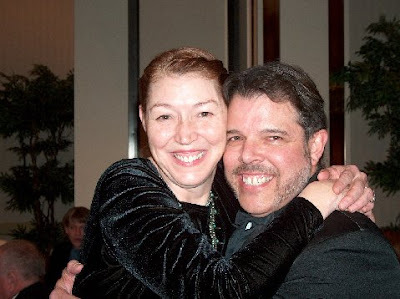 I was specifically asked by Dottie to share the terrible news, since she knew that I would one of the people able to get the word out to as many people as possible. It was very difficult for me to spread this news, since though I know many of you, I do not know each and every single persons relationship with him. That is impossible. Hearing the news via e-mail must have been terrible, though I know in my heart Dottie did not want people to hear about this months later. Richard had a lot of friends, and they needed to know. According to Dottie, Richard was outside working and when he returned to the house he did not feel well. She was unsure at the time of our conversation if Richard had suffered a coronary or an aneurism, but that seemed to be what the medics who arrived believed may be the case. Richard was a great friend, a passionate and sincere believer in the fact that our common history truly is The Greatest Show on Earth, an extremely driven man, very fun and completely and 100% genuine. Richard Slayton was all of that... and a hundred times more. For those of you that knew him, I sincerely share the pain of the untimely loss of a really great man. For those of you that unfortunately had not the opportunity to meet him I can only say this: ask one of us who did share our lives with him, and you will wish you had. We will be more that happy to tell you some great stories. I said it that day and I will say it again: I loved him. My solace comes from remembering our times on The Show, visits to his home in Idaho, reading e-mails from him and many, many phone calls that always lasted over an hour. In fact, if he called and got my voicemail, I knew I would have to have at least an hour clear when I called him back because we would always speak for way over a hour, and always talking about the same things - friends, family, and The Greatest Show On Earth. "We should all celebrate his life! It was full and laughing and brimming with friends. It was always positive, always looking forward, never dwelling on the negative. We should all learn from him. We should all get together and remember his life, laugh, party, cut up jackpots! Be joyous and send him good thoughts. This will make him happy. Remember, he is not gone. His physical body may be gone, but his spirit always lives. We will all see him again someday in that glorious, happy place he is now. That is something to look forward to! Richard Slayton Jr."
May God Bless Richard Slayton. 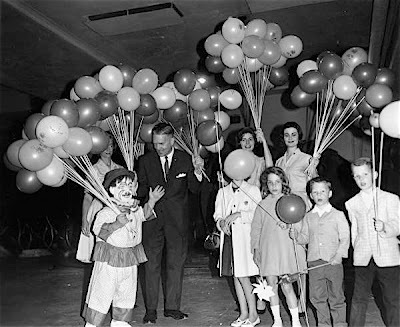 Frankie Saluto backstage on the Ringling Bros. and Barnum & Bailey Circus in the 1950's giving the VIP treatment to a large but unidentified family. 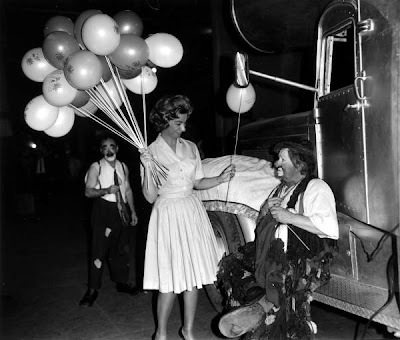 Otto Griebling backstage, sitting on the running board of the Zacchini's cannon, accepting a balloon from an unidentified woman. It looks like Toby Jorio's in the background. 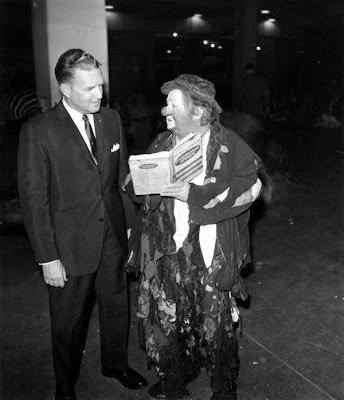 Otto Griebling backstage with an unidentified person. These may have been taken in or around Los Angeles and this guy might have been local politician or minor celebrity. An excerpt from a Latin-American film starring Cepillín. Why Cepillín is up in the right hand corner waving at us and (more importantly) why he is dressed like Jimmy Page are never explained. Maybe he's in Led Cepillin. 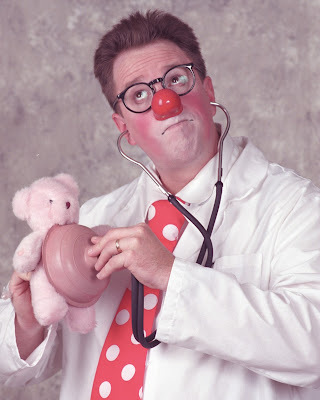 Clown College Grads, Clown Care Doctors, "China Clowns", Downtown Clowns, Bindlestiffs and any and all other assorted Goofs! Come out, hang out and beat the winter blahs! 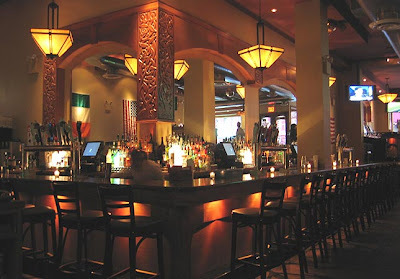 NY Area Clown "Hang" TONIGHT from 6:00 PM until closing at The Harmony View Grille at 50th and Broadway in midtown. During the Albacete festival competition (Spain), that will be held under a big top, an annex special event will be presented, in a special location. 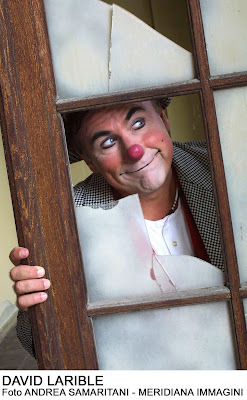 Into the ring of the Albacete refurbished "Teatro-Circo" building (one of the few surviving in the world) , will be presented the David Larible one man show. The show (created last year for Funambolika festival in Italy) is directed by Raffaele De Ritis. In the ring with David will be the white-face Gensi and Kuntz, the Roncalli pianist. Photos of Batatolas (Pedro Almedeida) from Circo Coliseu of Lisbon. My guess is Dukey Anderson. Anyone out there know for sure? 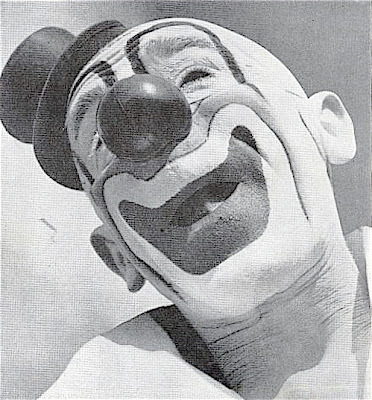 Emmett Kelly attempting to balance a feather on his nose while juggling three balls on the track of the Ringling Bros. and Barnum & Bailey Circus, under canvas, in 1947. I haven't posted anything so far on the passing of Ottavio Canestrelli for several reasons, not least of which is that the story leaves me so profoundly saddened. I apologize for the delay. I didn't know Ottavio. I'd never met him. When I first heard news of his passing I'd assumed that he was an older performer who had left us after an illness. There were no details. 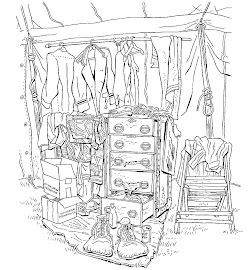 As the details came in, and fleshed out the story of his life for me, I was stunned. We've lost an extremely gifted performer, a wonderful person and someone I wish that I'd been fortunate enough to know. 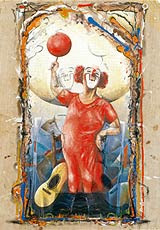 Ottavio Canestrelli was born and raised in the circus. He started performing at the tender age of 4 with his brothers; soon Ottavio became the star performer in his family's teeter-board act. He also had a hilarious comedy "knock-about" act with his twin brother. 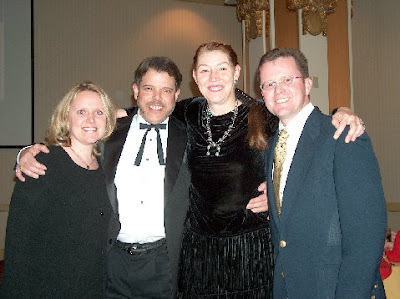 After many years of traveling and performing throughout the US, Canada and Mexico the Pietro Canastrelli Family (as they were called) entered adulthood. As a result they went there separate ways. 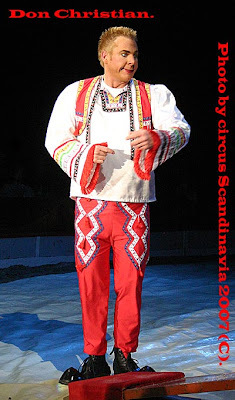 You may visit Ottavio's website by clicking here or visit his memorial MySpace page by clicking the title of this post. Ottavio is, and will continue to be, greatly missed. Tom Dougherty and the clowns of the Blue Unit of Ringling Bros. and Barnum & Bailey on opening night of the current Over the Top tour. 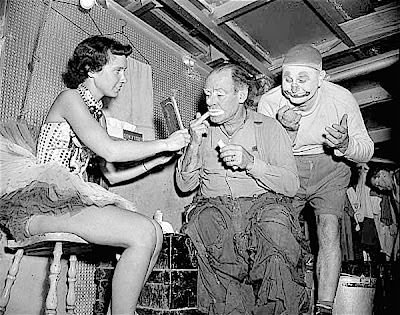 Emmett Kelly, less than halfway through his famous face and already wearing twice as much makeup as 98% of the current Ringling Alley, sharing a dressing room under Art Concello's seat wagons with Felix Adler in the late 40s/early 50s. Don Christian who can be seen this coming season in the Finish Circus Finlandia, has been contracted for the 2009 season in the Swedish Circus Maximum. 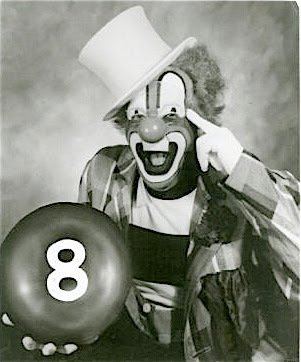 For the 2008 season the clowning will be done by the Russian reprise clowns Duet Blues. 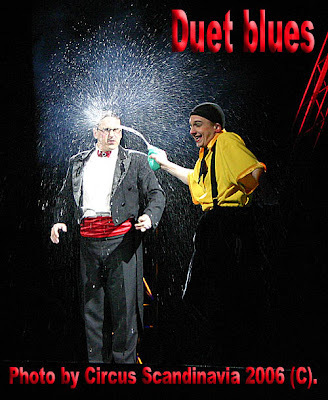 Duet Blues appeared with the Danish Circus Arena in 2006. 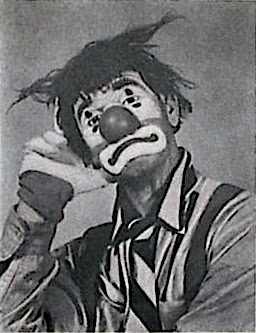 A fixture on the Shrine circuit, John Toy taught one (unhappy) session at Clown College under Bill Ballantine. 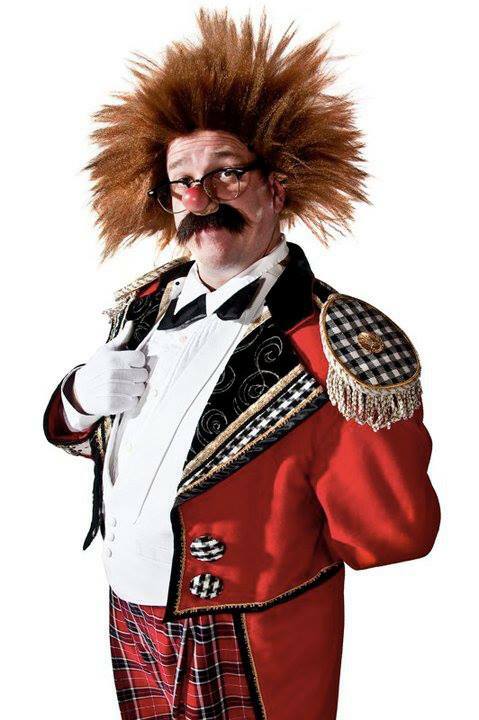 Greg DeSanto informs us that Mr. Toy passed away several years ago and his costumes and props were donated to the Circus World Museum in Baraboo, WI. 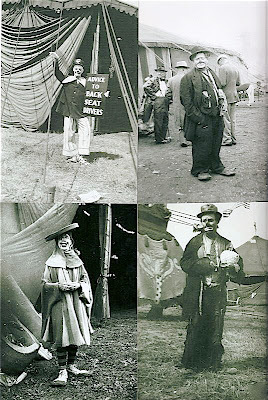 Nicolai Poliakoff's (Coco the Clown of the Bertram Mills Circus) two sons, Sasha and Michael, on the Mills Bros. 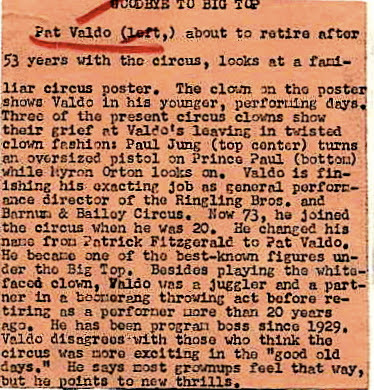 Circus in America in the 1950s. 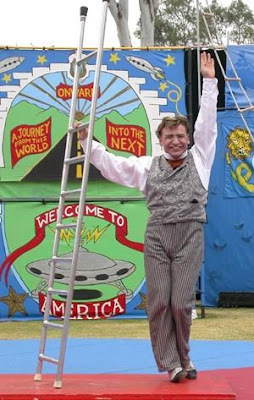 Both went back to the UK but Michael returned a few years later and was an essential part of the Ringling Alley in the 1960s. I've begun hospital clowning again. 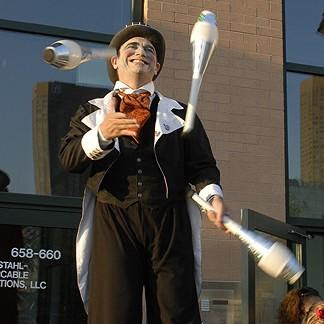 I'm not with the Big Apple Circus Clown Care Unit (and I'm not currently at liberty to discuss my possibly joining the CCU somewhere down the road) but with my own program at a nearby hospital. I'd forgotten how much I truly loved it until my first round yesterday. I don't know how many times Lou wore this whiteface (it couldn't have been much) but there must be a billion and seven pictures of him in it. 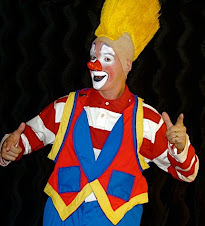 THIS is the makeup that Larry Harmon should have adapted for the actors who would play Bozo the Clown on TV. 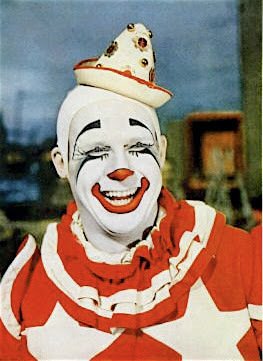 Instead, most seem to have adapted Jimmy Stewart's makeup from The Greatest Show on Earth. Roland Dittmar and Agnes Nemeth, winners of the bronze prize at the 7th International Circus Festival of Budapest, 2008. Here's a photo from 1980 of me and Bobby Kay! Taken in the Alley in MSG. 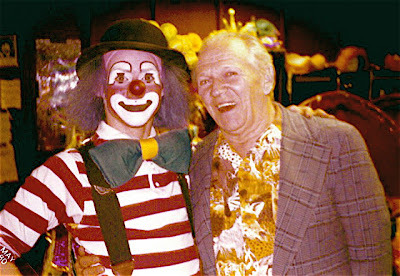 He was a great clown!